In dense stellar systems such as globular clusters and dense nuclear clusters, the stellar densities achieved are huge compared to other regions in a galaxy. This leads to the dynamical formation of binaries of compact objects, which makes these systems the breeding ground of sources of gravitational waves for the advanced detector LIGO and also Virgo. Binaries can also form in the field. In spite of their very different formation paths, the two types of binaries are observed in aLIGO with very similar properties due to a selection effect. In 2015 I submitted a paper in which I predicted these properties. The very first detection of a gravitational wave, as announced in February 2016 showed that my prediction was correct. 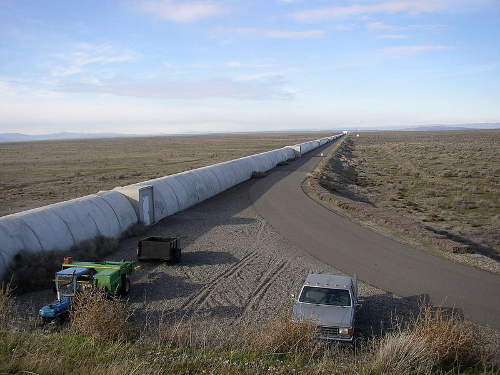 Northern arm of the LIGO interferometer on Hanford Reservation. Wikipedia, public domain. The field of GWs has reached a milestone in the last years with the build-up of an international network of GW interferometers which have achieved their design sensitivity. The ground-based detector LIGO (and soon Virgo) has undergone major technical upgrades that has increased the volume of the observable universe by a factor of a thousand. This is referred to as the “advanced” configuration. Thanks to this configuration, aLIGO detected directly for the first time in history, a gravitational wave, as announced in February 2016. The properties of this source had been predicted by me in a paper in 2015. Dense stellar systems such as globular clusters, galactic nuclei and, in particular, dense nuclear clusters, are the breeding ground of the sources that the advanced detectors can expect. The data that will be harvested from the advanced detectors will allow us to do GW astrophysics. The construction of templates for matched filtering is crucial in the searches for compact binaries. There have been efforts to construct these templates by combining post-Newtonian calculations of the inspiral of the binary with numerical relativity simulations of the merger and ringdown. However, the search will be challenging for the simple reason that a gravitational wave has not been detected yet directly. Reliable estimates of the event rates for the different kinds of binaries and of the expected parameter distribution will possibly be crucial for a successful detection. On the other hand, once we have the data, we will be able to compare the observed rates and parameters with the predictions derived from different models and thus filter them. This will enlighten our understanding of the creation and evolution of compact binaries in dense stellar systems. However, this is not an easy task, since the evolution of these systems involves the integration of N bodies with high resolution in time and space, including hard binaries, their encounters and relativistic corrections. In our group we have developed the first implementation in an N-body code of all non-spinning PN corrections up to 3.5PN order and all spin contributions up to 2.5PN order, including spin precession equations. We employ non-spinning post-Newtonian corrections to the Newtonian accelerations up to 3.5 post-Newtonian (PN) order as well as the spin-orbit coupling up to next-to-lowest order and the lowest order spin-spin coupling. We have also integrated spin precession and a consistent treatment of relativistic mergers for the first time ever. One of the fundamental goals of our research is the realistic modelling of GW sources forming in dense stellar clusters for the ground-based detectors aLIGO and Virgo.